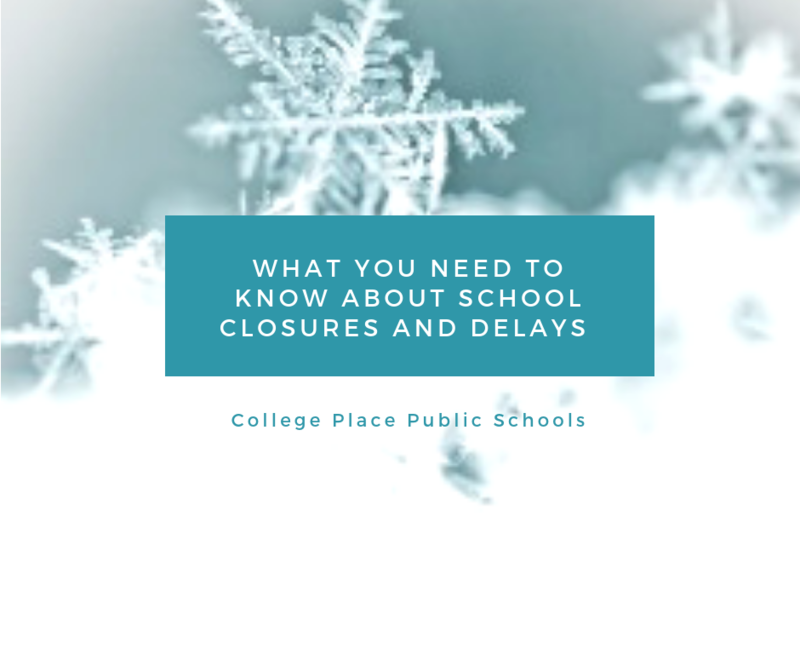 Winter is upon us and this may cause College Place Public Schools to close or delay school in the event of snow, ice or other weather-related emergencies. We will make every effort to announce closures or delays by 6:00 a.m. If conditions change or worsen after the decision is made to delay school, it is possible that the district may cancel school. We will try to make a final decision by 7:00 am. If there is no mention on the district website of delays or closures, schools are running on the normal schedule. Make sure your phone number is correct in Skyward Family Access under Family Information. If you want messages sent to your cell phone, you must make sure that Phone 1 is your cell phone number. Download the FREE App at the App Store or at Google Play. Search for College Place Public Schools. Once downloaded, make sure your Notifications are turned on in Settings. Follow updates on Facebook If you are not following the CPPS Facebook page, make sure to do so that you will receive notifications. What happens with a 2-Hour Delay? If the District calls a 2-hour delay, there is still the possibility it could change to a closure if conditions worsen. Please continue to check the website frequently for any updates and remember to refresh your browser. If school is delayed, buses will run on a 2-hour delay from normal pick-up times and breakfast service and preschool will be canceled. What happens When School is Closed? If school is closed, all out-of-district transportation, meetings, field trips, after-school activities, practices, and games will be canceled for the day unless otherwise announced. All evening meetings and events scheduled to take place in district facilities will also be canceled. If you have any questions please feel free to contact the District office at 509-525-4827 or call your student(s) school office. College Place Public Schools is an equal opportunity employer and complies with all requirements of the ADA.